More and more prestigious manufacturers of up-market design products participated in this year's EuroShop, a clear indication of the significant international role of this Düsseldorf trade fair. As a result this successful trade fair is a model of what the retail industry is looking for - increased growth and high turnover levels. When we think of retail design we tend to think first and foremost of store construction. However, a visit to the fair makes it clear that retail design covers a great deal more than this. Here all the threads come together, linking the areas of retail design, corporate architecture, shop fittings, store systems, building utilities, IT solutions, advertising and marketing concepts. EuroShop is not just interesting and informative – it is in fact not to be missed for all those who are involved in the development of commercially used buildings, because this is where the interfaces are. These interfaces provide planners with vital interdisciplinary know-how with regard to merchandise management, construction of refrigeration facilities, cash register and payment systems right down to the spatial planning and integration of advertising areas and media. Egger covers almost every single application of wood within buildings, while also offering consultancy and support for detailed planning. 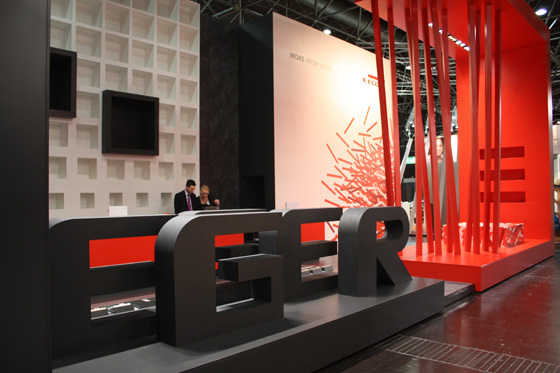 With its longstanding expertise in building with wood, the firm of Egger also offers a wide product spectrum of products, including solutions for architects and planners, trade fair and store construction companies, producers and craftsmen. Floors, walls and ceilings as well as elements such as doors, entire kitchens and interior furnishings – Egger covers almost every single application of wood within buildings, while also offering consultancy and support for detailed planning. 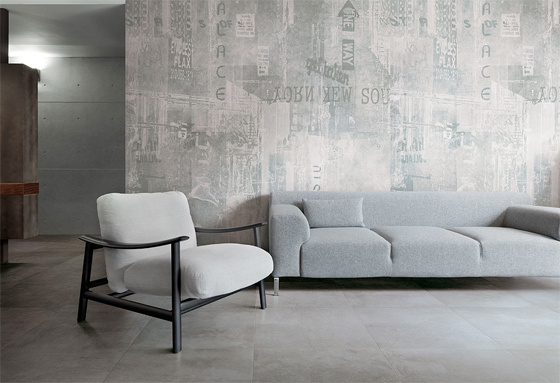 Ceramiche Refin's Graffiti collection consists of stoneware but has the visual character of a cement surface, with decors that derive their inspiration from industrial and urban motifs. 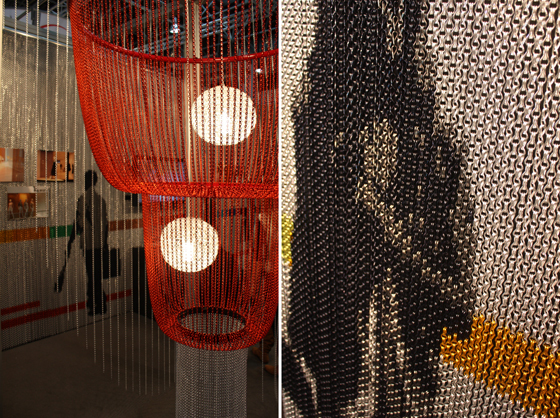 Ceramiche Refin presented its Terraviva and Graffiti collections at EuroShop. The Terraviva project for DesignTaleStudio bears the signature of Massimilano Adami and is a new step by the company in its experiments and research in the field of ceramics. Terraviva displays a stylised, dark crack on the glazed white tile. 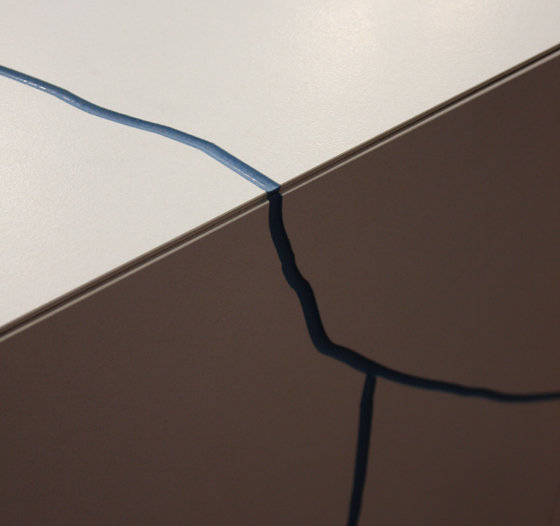 At a poetic level it highlights the characteristic original clay component of the stoneware: tensions in the material which develop as a result of extreme temperatures can lead to cracks. The image of clayey earth, dried and caked by the sun, appears in front of our inner eye. An attractive tribute to the origins of this material, which humanity has been using for millennia for building purposes, the Graffiti collection consists of stoneware but has the visual character of a cement surface, with decors that derive their inspiration from industrial and urban motifs. 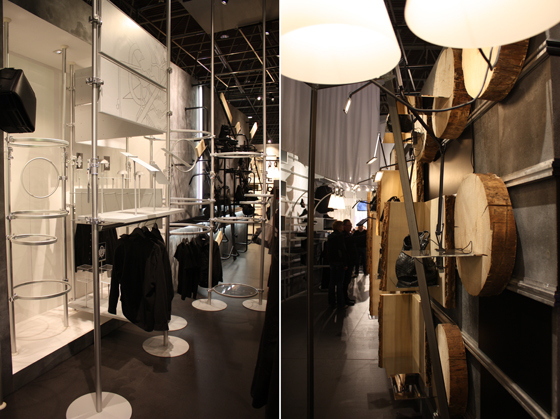 The Casamood sub-brand by Florim was represented at the fair as a partner to ALU, the Italian world leader in the design and manufacture of aluminium display systems for the retail trade. 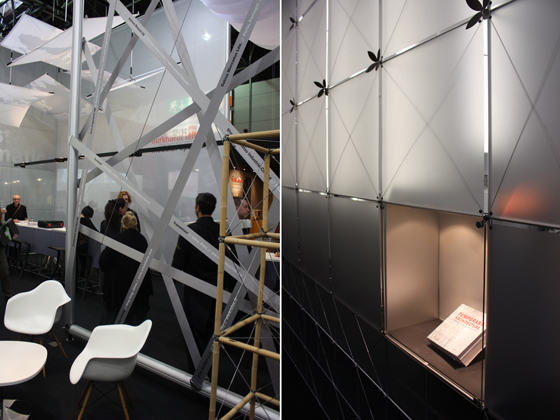 The Nera collection covered the entire 350 m² ALU exhibition area, which in addition to display systems and tiles, also featured lighting by FLOS and loudspeakers by AUX. ALU also launched the JAK competition for students, with ten teams set the challenge of creating ten different display window designs. The whole competition has been recorded on video and can be seen on YouTube and Facebook, among other places. LEDs integrated into shelving and merchandise fixtures ensure that shopfitting systems by the firm of serafini provide the right setting for goods of all types. 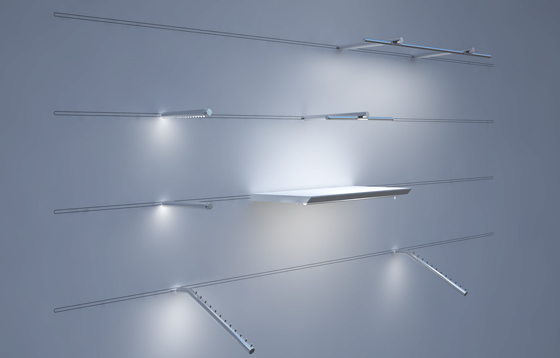 The 'Clips LED' and 'Slide 6/8 LED' systems provide striking lighting effects by highlighting the product while keeping the light source hidden within the shelf or fixture. Shelving elements are simply clipped into the system, providing perfect lighting for the goods while the power source remains concealed in the wall. Electrified and non-electrified merchandise fixtures can be combined without any difficulty. 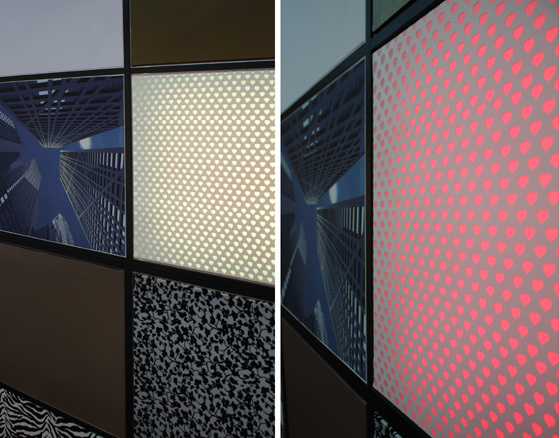 KriskaDECOR® is a metal curtain which offers unique possibilities for dividing and decorating rooms. KriskaDECOR® is a real metal fabric made of anodised aluminium and consists of a light, flexible network of small interwoven sections. The product offers a wide range of design options, in that the aluminium can be coloured across its entire surface or decorated with logos, patterns and images. Kriska metal fabrics are resistant to damage from UV rays and from water, including salt water, and have the further advantage of being fully recyclable. In addition they are light, hygienic, easy to clean and not flammable. 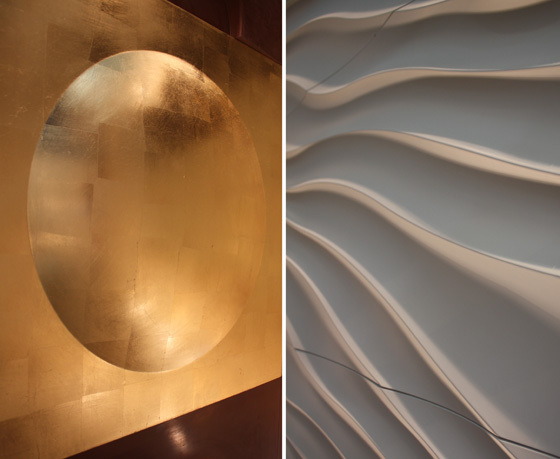 Stoneslikestones displayed wall panelling with a 3-D effect, confirming its experience and expertise in the field of design for restaurants, hotels, wellness facilities, shop in shop and all applications involved in retail outlet construction. Barrisol has a wide product range but the company's core expertise is focused on stretch ceilings. With special equipment the Barrisol PVC sheeting is converted into acoustically and thermically effective surfaces and provided with a wide spectrum of decors. It can serve as a sunshade or be converted into lighting fixtures. The construction system is also provided by Barrisol. 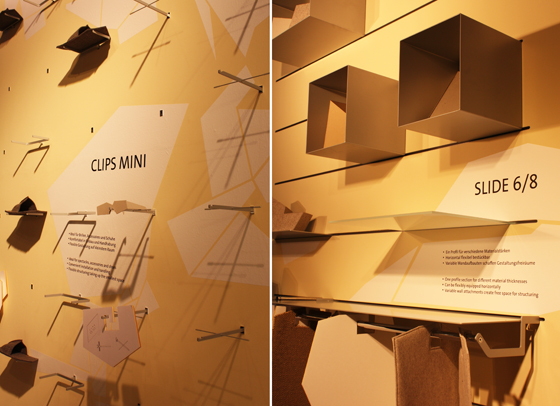 Shopkit specialises in the conception and production of high-quality presentation systems. 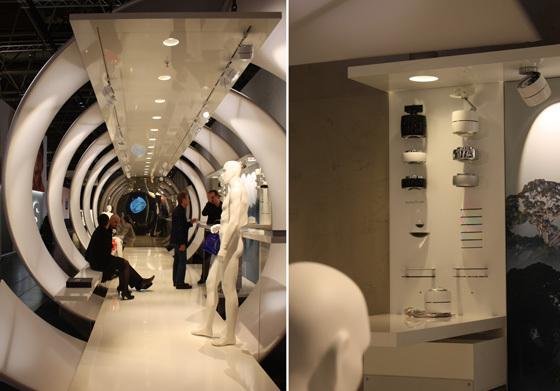 Among other products the company's range includes display and shelving systems connected by cables, signage systems, brochure dispensers, glass display cases, illuminated frames, digital displays and much more. TracKit is the new rail system by Shopkit for the mobile and flexible presentation of graphics, sliding panels, shelving and textile displays. 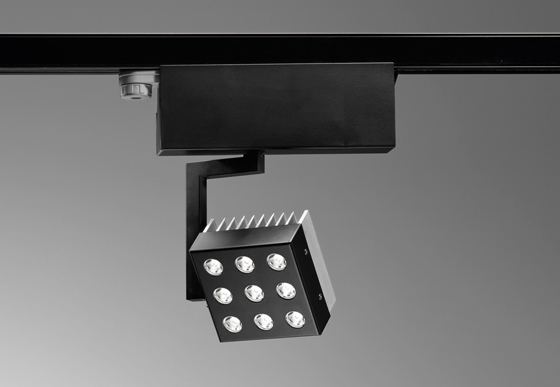 TracKit is available for wall or ceiling fitting, with a single or double rail which enables presentations to be created with spatial depth and different levels. Rosskopf meets the most demanding requirements of clients from the fields of architecture, design, processing, specialist retailers of kitchens and bathrooms as well as the furniture industry. The company provides all-round services covering engineering, product development, production and implementation. Rosskopf specialises in the processing of mineral materials, quartz stones, porcelain ceramics and glass ceramics (e.g. Corian, Hi-Macs, Silestone and many others). The example of the information centre at the Westfield London Shopping Centre makes it clear that the Rosskopf & Partner engineers have succeeded with precision in implementing the instructions of the architects Pearson Lloyd, and have found a perfect solution to the technical requirements of the design. 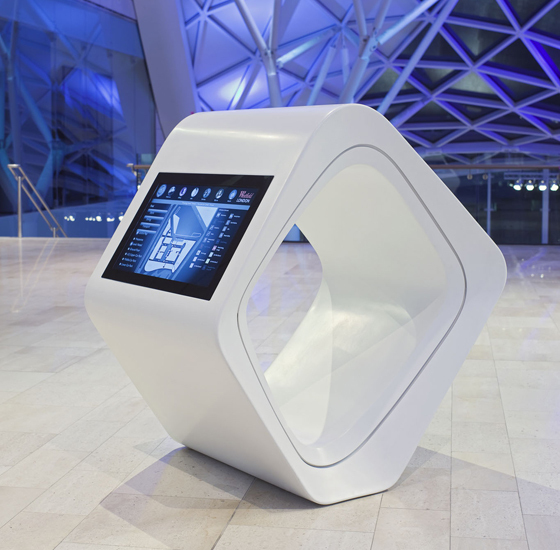 The sculptural objects with touch-screen monitors enable visitors to find their shop by an interactive process. In addition illuminated signage, machined pictograms and printed panels demonstrate what can be achieved with mineral materials. 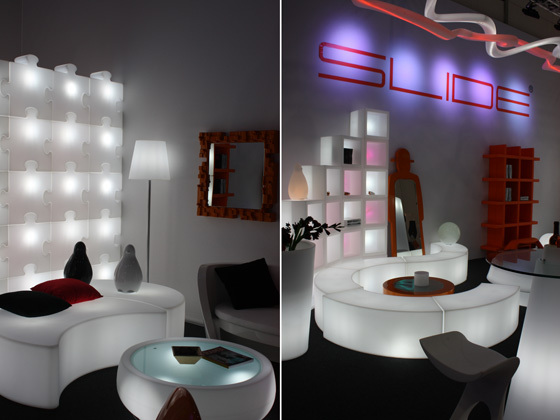 The Italian firm of Slide relies on three factors in the creation of its products: the tried-and-tested material polyethylene, rotational moulding as the production method and designs by prestigious designers. The result is furniture and lighting fixtures which have a range of different applications for both interior and exterior use, and are ideal for events, private housing and public buildings. Lighting is always one of the most important topics when it comes to the presentation of products and goods. 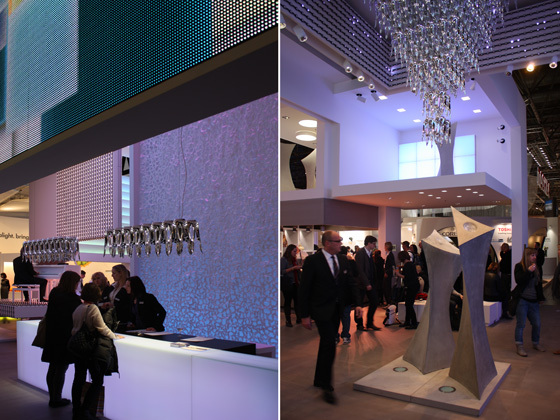 Accordingly numerous suppliers of lighting products and systems as well as lighting designers were represented at EuroShop with the latest products and concepts of professional lighting technology. Sheherazade, the Persian queen and storyteller of the 1001 Nights, provided the name for this product by Targetti. 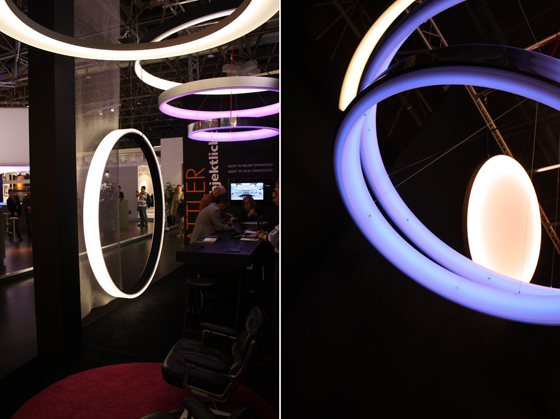 The different modules – flat, wavy or curved – can be combined to form a straight, circular or meandering strip of lighting. ARTEMIDE selected a number of products and displayed its technological versatility and creativity as an expert partner for shop lighting. ARTEMIDE continues to rely on cooperation with the most prestigious contemporary designers such as Ross Lovegrove, Ernesto Gismondi, Herzog & de Meuron, Carlotta de Bevilacqua and Michele De Lucchi. 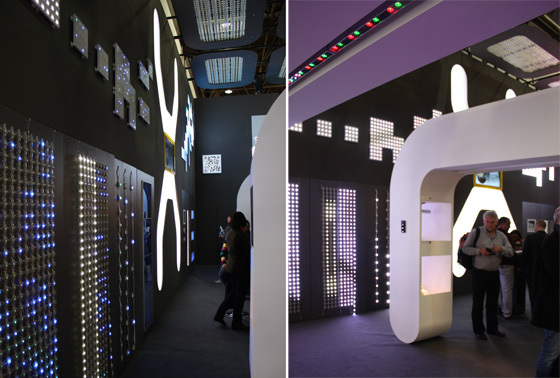 The company presented products from its Design (Skydro, Mercury, Nur, Pipe), Architectural (PAD, Java system, Nothing system, Picto), and NordLight ranges (Parabola, Spike RGB, and a wall installation with specially created lighting effects). Zumtobel presented innovative lighting solutions for sales environments such as display shelving, shop windows, counters for fresh produce and display tables. In the evening the large open booth with its varying shades of white was turned into a stylish setting by an impressive multimedia show. 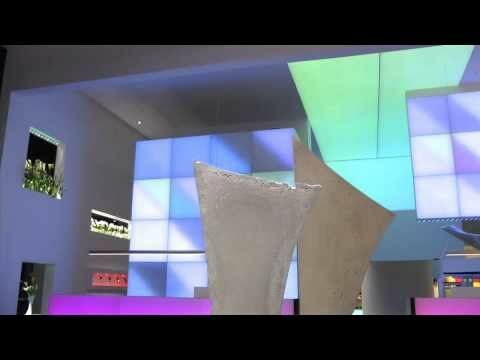 Traxon Technologies is a world leader in LED lighting systems and provides high-quality RGB and white light solutions for architecture, restaurants and retailing. Together with its subsidiary 'e:cue', which specialises in the professional controlling of lighting systems, Traxon Technologies offers its customers complete solutions, ranging from innovative lighting systems to highly sophisticated system control solutions. Apart from numerous installations which include famous architectural landmarks such as London's Tower Bridge, the Guggenheim Museum in New York, the International Commercial Center in Hong Kong and the Stadsfeestzaal in Antwerp, as well as the interior decoration of stores operated by Chanel, Biotherm, Louis Vuitton, Diesel and many other prestigious brands, Traxon covers a number of segments of the market and has the know-how and experience to use light for the purpose of presenting the most diverse objects of varying sizes and complexity in an entirely new setting. Planlicht offers not just a comprehensive range of lamps but also, as the name suggests, has its own planning department for the technical lighting concept of individual projects. The company's core expertise lies in the planning of public facilities, in which decorative low-voltage lamps and strip lighting are used. 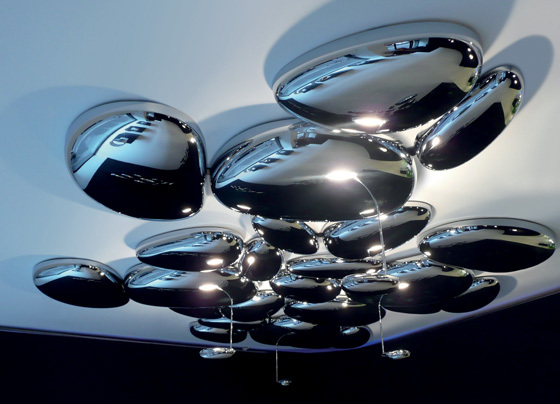 Behind the firm of Occhio is designer Axel Meise, who for more than two decades has been leading the way in the field of lighting design. 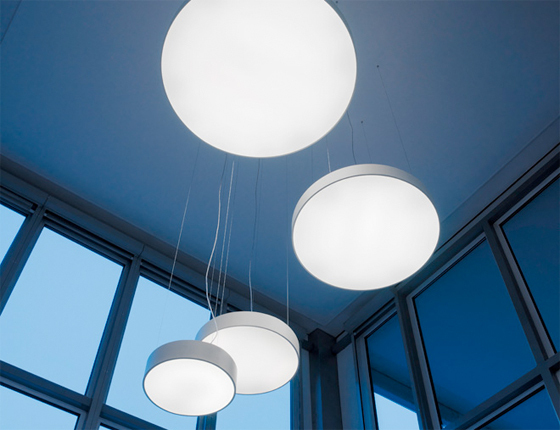 With its comprehensive spectrum of modular lighting systems Occhio has developed into one of the most successful lamp producers of recent years. 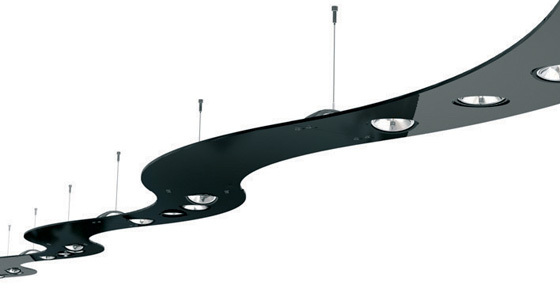 With its 'Occhio System' and 'Occhio Strahler' ranges the company offers lighting which ranges from standard lamps via wall and ceiling-mounted lamps to pendant lamps, which means that their modular design enables them to be used for the widest possible range of lighting applications and requirements, and guarantees an all-round lighting and design language within the building. 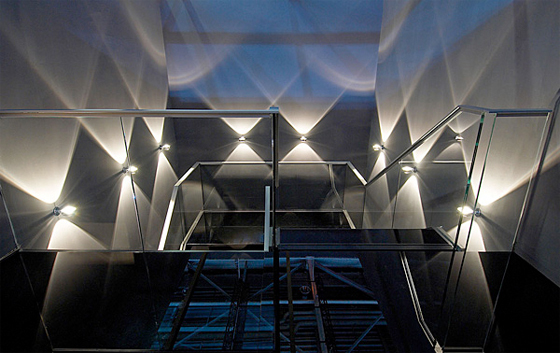 Sattler Objektlicht provides the innovative conception and implementation of high-quality planning and design solutions in the field of lighting. The company's many years of experience in the application of light in the context of spatial requirements flow into individually planned lighting concepts. In addition to luminous ceilings, panel lights, project lighting, system lighting and individual lamps Sattler also specialises in lighting for medical facilities and laboratories. With this selection we have compiled for you a range of quality products and solutions which demonstrate that the presence of many premium brands indicates that Euroshop is increasingly becoming unmissable for the manufacturers of products and furnishings for restaurant, hotel and retail projects, as well as representing a worthwhile date in the diary of all planners, project managers and designers.